I started the day with a pretty clear idea of what my Christmas Eve would look like and what this week’s blog would be about. Then the cosmos tossed me a curve-ball and for a little while I thought this might be the Wednesday I miss a posting. Life sometimes wants to upset your stride and capture your attention in the most dramatic ways. Today life tried and failed. So here I sit in front of my computer wondering what to say. I know what I’m thinking about. I am surrounded by some incredible people. Sometimes I feel unworthy of their friendship, but mostly, their steadfast love and support just makes me believe that the karma tide is turning. My religion rocks. At the end of the Tibetan Buddhist ceremony at Thrangu Monastery on Sunday night, before the presiding Lama left the shrine room, he wished us all a very Merry Christmas. We should all be that inclusive. Music. It gives me more joy than anyone knows and I marvel at people who do it well. The world is a better place because of Ricky Gervais. His Derek series is perfect. And… I am a writer. I will write. Period. Tomorrow is Christmas. As percentages go, only a few folk will get to be with the people that matter most to them. If you are one of the lucky ones then count yourself blessed. You won the lottery. Be kind. Strive for happy. Make the most of December 25th. 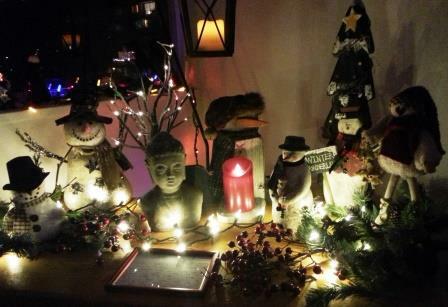 Buddha and Christmas at the Barker home. journey. Enjoy the festive season. Thanks Wendy! Hope you have a great day… and hopefully we’ll see you on the bridge later! Merry Christmas, Tricia!! And the absolute best possible New Year!!! Thank you. Merry Christmas Tricia!